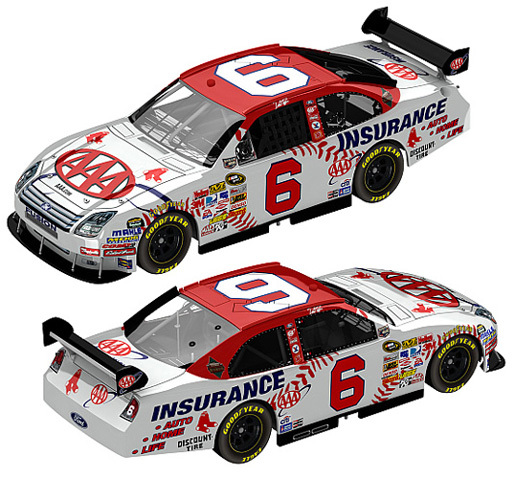 2012 Boston Red Sox '12 Fenway Park 100 Years - MLB Baseball / NASCAR diecast, by Action. 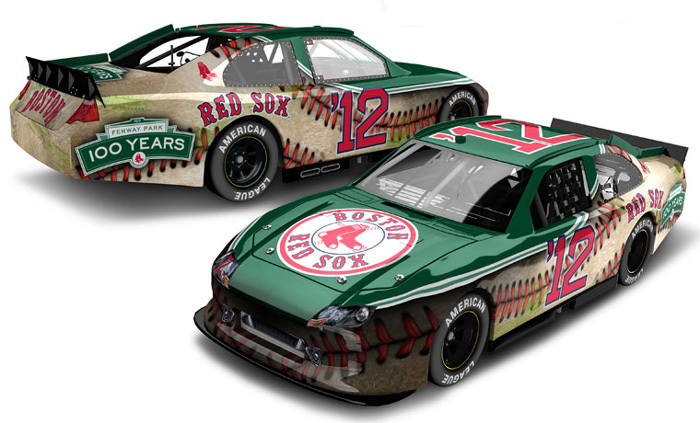 Boston Red Sox Major League Baseball NASCAR diecast featuring the Fenway Park 100 years logo, now available from Lionel Racing Collectables. Officially licensed Boston Red Sox MLB Baseball 5.75" x 4.5" color ultra decal. Officially licensed Boston Red Sox MLB Baseball 3" x 12" decal strip. Decal strips can be placed on a variety of surfaces, not just a bumper. Made in USA. Officially licensed Boston Red Sox 17.75" x 5" MLB Baseball street sign made of durable plastic with die cut hanging holes. The Red Sox Way sign is a great decorator piece, works great outside or indoors, perfect to hang on doors. Made in USA. Boston Red Sox / Farewell at Fenway Big Papi Day Framed Panoramic Photograph. This officially licensed MLB panorama photo is of Fenway Park in Boston, during a ALDS game against the Cleveland Indians on October 10, 2016 (Big Papi Day). This was David Ortiz "Big Papi" last MLB game. The standard panorama features your choice of black or cherry wood frame. Actual size is 40" x 14"
Boston Red Sox / 100th Opening Day Fenway Park Framed and Matted Panoramic Photograph. This officially licensed MLB panorama photo is of the Boston Red Sox (100th Opening Day) at Fenway Park in Boston, MA. during the Opening Ceremony on April 13, 2012. The Boston Red Sox defeated the Toronto Blue Jays 12-2. The deluxe panorama features black or blue double matting and your choice of black or cherry frame, with a 1" x 4" engraved brass nameplate. Actual size is 40" x 14"
Boston Red Sox / 100th Opening Day Fenway Park Framed Panoramic Photograph. This officially licensed MLB panorama photo is of the Boston Red Sox (100th Opening Day) at Fenway Park in Boston, MA. during the Opening Ceremony on April 13, 2012. The Boston Red Sox defeated the Toronto Blue Jays 12-2. The standard panorama features your choice of black or cherry wood frame. Actual size is 40" x 14"
Boston Red Sox / A Century at Fenway Park Framed and Matted Panoramic Photograph. This officially licensed MLB panorama photo is of the Boston Red Sox (A Century at Fenway) Centennial Ceremony at Fenway Park on April 20, 2012. The Boston Red Sox celebrated 100 Years at Fenway Park prior to the game with the New York Yankees. The deluxe panorama features black or blue double matting and your choice of black or cherry frame, with a 1" x 4" engraved brass nameplate. Actual size is 40" x 14"
Boston Red Sox / A Century at Fenway Park Framed Panoramic Photograph. This officially licensed MLB panorama photo is of the Boston Red Sox (A Century at Fenway) Centennial Ceremony at Fenway Park on April 20, 2012. The Boston Red Sox celebrated 100 Years at Fenway Park prior to the game with the New York Yankees. The standard panorama features your choice of black or cherry wood frame. Actual size is 40" x 14"
Boston Red Sox / Matsuzaka vs Suzuki at Fenway Framed and Matted Panoramic Photograph. This officially licensed MLB panorama photo is of Fenway Park in Boston, MA. during a matchup with the Seattle Mariners on April 11, 2007. Japanese players Daisuke Matsuzaka pitching vs Ichiro Suzuki at the plate. The deluxe panorama features black or blue double matting and your choice of black or cherry frame, with a 1" x 4" engraved brass nameplate. Actual size is 40" x 14"
Boston Red Sox / Matsuzaka vs Suzuki at Fenway Framed Panoramic Photograph. This officially licensed MLB panorama photo is of Fenway Park in Boston, MA. during a matchup with the Seattle Mariners on April 11, 2007. Japanese players Daisuke Matsuzaka pitching vs Ichiro Suzuki at the plate. The standard panorama features your choice of black or cherry wood frame. Actual size is 40" x 14"
Boston Red Sox / The Green Monster Framed and Matted Panoramic Photograph. This officially licensed MLB panorama photo is of "The Green Monster" at Fenway Park in Boston, MA. home of the Boston Red Sox on July 26, 2003. The Boston Red Sox defeated the New York Yankees 5-4. The deluxe panorama features black or blue double matting and your choice of black or cherry frame, with a 1" x 4" engraved brass nameplate. Actual size is 40" x 14"
Boston Red Sox / The Green Monster Framed Panoramic Photograph. This officially licensed MLB panorama photo is of "The Green Monster" at Fenway Park in Boston, MA. home of the Boston Red Sox on July 26, 2003. The Boston Red Sox defeated the New York Yankees 5-4. The standard panorama features your choice of black or cherry wood frame. Actual size is 40" x 14"
Boston Red Sox / Rivalry at Fenway Framed and Matted Panoramic Photograph. This officially licensed MLB panorama photo is of Fenway Park in Boston, home of the Boston Red Sox, during (Rivalry at Fenway) game 3 of the MLB ALCS on October 16, 1999. The Boston Red Sox defeated the New York Yankees 13-1. The deluxe panorama features black or blue double matting and your choice of black or cherry frame, with a 1" x 4" engraved brass nameplate. Actual size is 40" x 14"
Boston Red Sox / Rivalry at Fenway Framed Panoramic Photograph. This officially licensed MLB panorama photo is of Fenway Park in Boston, home of the Boston Red Sox, during (Rivalry at Fenway) game 3 of the MLB ALCS on October 16, 1999. The Boston Red Sox defeated the New York Yankees 13-1. The standard panorama features your choice of black or cherry wood frame. Actual size is 40" x 14"
Boston Red Sox 2013 World Series Framed and Matted Panoramic Photograph. This officially licensed MLB panorama photo is of Fenway Park in Boston, during the Opening Ceremony of the 2013 World Series on October 23, 2013. The Boston Red Sox defeated the St. Louis Cardinals 4 games to 2. The deluxe panorama features black or blue double matting and your choice of black or cherry frame, with a 1" x 4" engraved brass nameplate. Actual size is 40" x 14"
Boston Red Sox 2013 World Series Framed Panoramic Photograph. This officially licensed MLB panorama photo is of Fenway Park in Boston, during the Opening Ceremony of the 2013 World Series on October 23, 2013. The Boston Red Sox defeated the St. Louis Cardinals 4 games to 2. The standard panorama features your choice of black or cherry wood frame. Actual size is 40" x 14"
Boston Red Sox 2013 World Series Champions Framed and Matted Panoramic Photograph. This officially licensed MLB panorama photo is of Fenway Park in Boston, after the Boston Red Sox defeated the St. Louis Cardinals in game 6 of the 2013 MLB World Series on October 30. The deluxe panorama features black or blue double matting and your choice of black or cherry frame, with a 1" x 4" engraved brass nameplate. Actual size is 40" x 14"
Boston Red Sox 2013 World Series Champions Framed Panoramic Photograph. This officially licensed MLB panorama photo is of Fenway Park in Boston, after the Boston Red Sox defeated the St. Louis Cardinals in game 6 of the 2013 MLB World Series on October 30. The standard panorama features your choice of black or cherry wood frame. Actual size is 40" x 14"